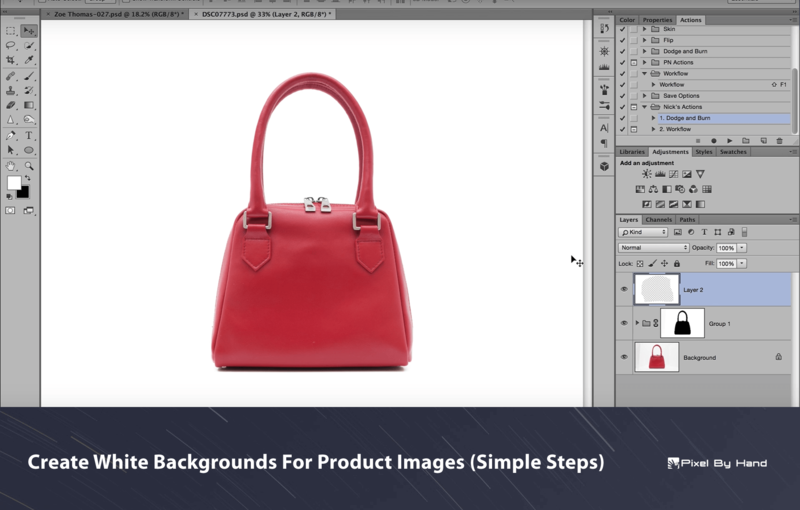 For this tutorial, we will be showing step by step you how to get a perfectly white background for your product images. We will be using Adobe Photoshop to edit our example image. It’s highly recommended that you use the same type of software for all your image editing. The learning curve for the software is quite steep, but once mastered you can produce great looking backgrounds very quickly. So let’s get started. In the image below you can see and example handbag. The background is not that bad as a starting point. The background in this particular image is a simple poster board that can be bought fairly cheaply. You may feel that just shooting onto the poster board background would be enough. If you truly want your product to stand out then it’s a good idea to make the background completely white (or whatever colour you choose for your product backgrounds). It’s also a good idea to keep all your backgrounds exactly the same colour, in order to develop a consistent brand image for your site. In the image below you can see that on the left-hand toolbar the colour picker tool has been selected. I clicking on one of the areas in the background. We can clearly see that the colour is not pure white. In fact, in this example the colour number is #f1f1f1. So let’s show you exactly how we get to a completely pure white background. On the top menu, we click select, then colour range. We are going to use the eyedropper tool (that is selected by default). We will select an area that has already got a pure white area, or as close to it as possible. You will notice that a mask is being created (the black bag) in the colour range box. Using the fuzziness slider, we need to find a sweet spot between how the background looks coupled with how the mask of the bag books. For example, if we move the slider too far across then the background is very poor. By selecting a fuzziness around 160 we can see that the white background is in pretty good shape and also the majority of the bag (the mask) is black. When we are happy we click ok.
And this is what we are left with. We can see our selection with the ‘crawling ants’ or dotted Lines. At this stage, the image does not need to be perfect. In the bottom right-hand corner click the group button. Then we will click the mask button also in the bottom right-hand corner. This will create a mask on top of that group. Next, we will alt-click the mask. This will actually show us the mask in the main window. We now need to darken any light areas that we want to keep such as the buckles and zip. To do this we need to select the brush tool. We then need to make the brush tool colour black by clicking on the colour palette. We need to make sure that near the top of the page obesity is 100% and flow is also set to 100%. On the same toolbar as capacity and flow, you will find the brush drop down. Click this and you then need to move the hardness slider down to 0%. The next part is critical in that we are going to change our mode. We clicked the mode button on the toolbar and then select overlay from within the dropdown menu. The reason we select overlay is to stop a brush from bleeding into the white background. Like the example below. By selecting overlay only the dark areas of the Mask will be affected. We hold down the mouse button and brush over all the areas of the Mask. You can see below that the dark areas have now gone completely back. This, in turn, creates a nice accurate mask. By continuing to rub over the lighter areas you can see they are also turned black whilst the background area remains completely white. To finish off the mask we will select under the mode tab – normal. And then go back to the areas which we were not able to mask. Next, in the bottom right-hand corner, we are going to select the making new layer button (inside the group). From here we’re going to click edit in the top menu bar, from the drop down we click on fill. Ensure that the content area has the white colour selected. Then click ok. The white area though it may appear to be pure white still has some dark areas. To get rid of these we will firstly close group 1 on the bottom right-hand side. We then need to create a new layer by clicking the button in the bottom right. We need to make sure that the pure white colour is selected in the colour picker and that normal is selected under mode. You can make your brush to a size that you feel comfortable with, then we just need to brush around the outside getting rid of any dark areas. We want the edges to be completely white so that they fit in with the white background on a webpage. That’s our image background completely changed to White. Now all you need to do is save your image into the format you require. White backgrounds are the perfect solution foremost e-commerce. It can be surprisingly easy to produce product shots with great backgrounds. If you have any questions about this tutorial feel free to get in touch with us. Take a look at our blog where you will find a variety of different tutorials to help you prepare your images for your website.